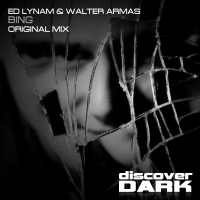 Discover Dark starts the year in style courtesy of this turbocharged banger from Ed Lynam and Walter Armas. Bing pulses with energy from the start and its not long before the kick and bass combination is joined by a screaming acid topline that drives the tune towards the break. Here a sampled vox joins the party set against a full on riff that kicks back hard into a full on kick, bass and acid. Bing heads towards the outro with plenty of stab and fx production action together with melodic runs that tease the dancefloor to perfection. A huge tune to start the year! 'Bing' is available now from Beatport and iTunes.